We are happy to present our brand-new LingvoSoft software collections giving you a chance to acquire a full set of translation and language learning applications you may need taking a full advantage of linguistic content included with the software. These unique software collections are customized by language and operating system and are divided in the following target groups: Learning Bundles, Travel Suites, Language Bundles by OS, Platinum Language Bundles, and Regional Bundles by OS. New LingvoSoft bundles include our brand-new software — FlashCards, Talking Dictionaries, Learning Voice PhraseBooks, etc. The new software is available for all well-known operating systems such as Windows Mobile, Palm OS, and Windows. Trial versions of the software included in each bundle are available for free trial download at our website. Simply choose your preferred combination from the list below and enjoy its multilingual capabilities! LingvoSoft Translator delivers effective and accurate full-text translation of any text or document — business letters, technical documentation, e-mail and much more. UK Special Offer! Order now and get 20% off the regular price! Plus get a free CD and free shipping too! Superb collections of Talking PhraseBooks with human voicing from LingvoSoft! UK Special Offer! Order today and get 20% off the regular price! Plus get a free CD and free shipping too! These unique collections consist of advanced applications for all the devices you have now or will have in the future. If you are studying a foreign language, a businessperson dealing with foreign partners, or a frequent traveller abroad, this comprehensive package will cover your needs in a most convenient and cost-effective way. UK Special Offer! Order now and get 20% off the regular price! Plus receive a free CD and free shipping too! These include software items grouped by operating system and different parts of the world. These include software items grouped by language and operating system. Please note that these offers are valid only in conjunction with your online order at www.ectaco.co.uk and cannot be combined with any other offers! Unique full-text translation software! 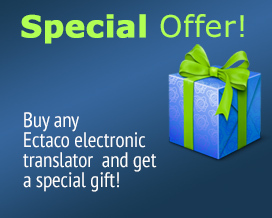 Translate texts, e-mails and webpages easily! Order today and get 15% off! Plus get a free CD and free shipping!